Today, the world is at our fingertips. We have a question, we type it in the search field and BAM - we get pages upon pages of possible answers. When it comes to packaging questions, you can get lost in an ocean of possible answers from a spectrum of sources. Primary research is done by you or a hired researching firm. Secondary research is information that is used from previously conducted studies. These results are usually found through the internet and databases and then applied to your own study. The downside is that this information may not apply directly to your company and the information may not be as helpful as conducting it on your own. 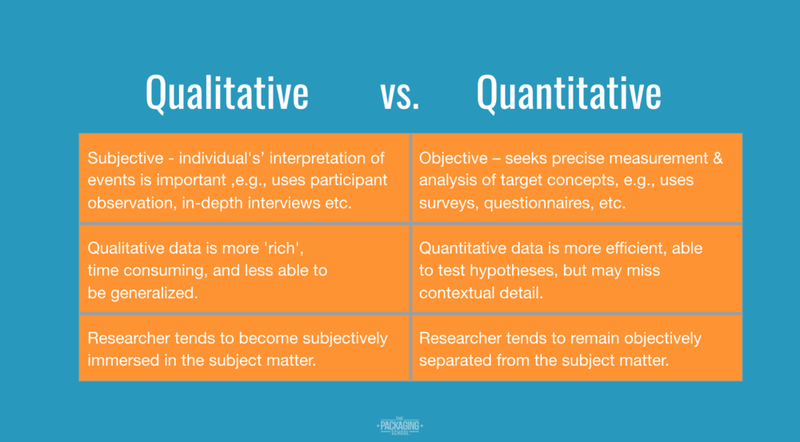 Qualitative data is collected in the following ways. Consumers can be observed shopping, reading labels, and interacting with the package—with minimal bias and distortion. During a depth interview, the moderator is also employing ethnographic techniques; that is, the moderator is carefully watching the body language, facial expressions, and movements of the respondent. Quantitative Data is collected using the two following methods. Lab experiments can be conducted to test how a package would react in different environments. Testing can be done to find the fail point of a package. This determines what dunnage is used and if the current design holds up to expectations. Another great resource for your research is PackagingSchool.com. Enroll in Packaging Design Workflow for more great packaging research tips! Newer PostCushioning Systems in Packaging- What's the Point? Older PostHow Sustainable is Paperboard Packaging?